Welcome to another installment of Show Us Your Space, a Reverb series that showcases the unique music-making environments of studio owners, builders, and musicians at all levels. So far, we've visited a variety of brilliant studios, like Enmore Audio in Sydney and the historic Electric Lady Studios in New York, as well as an all-tube equipment repair shop called Acouphonic in Vouvray, France. This week, we're back in our hometown of Chicago to take a tour around Alchemy Audio. 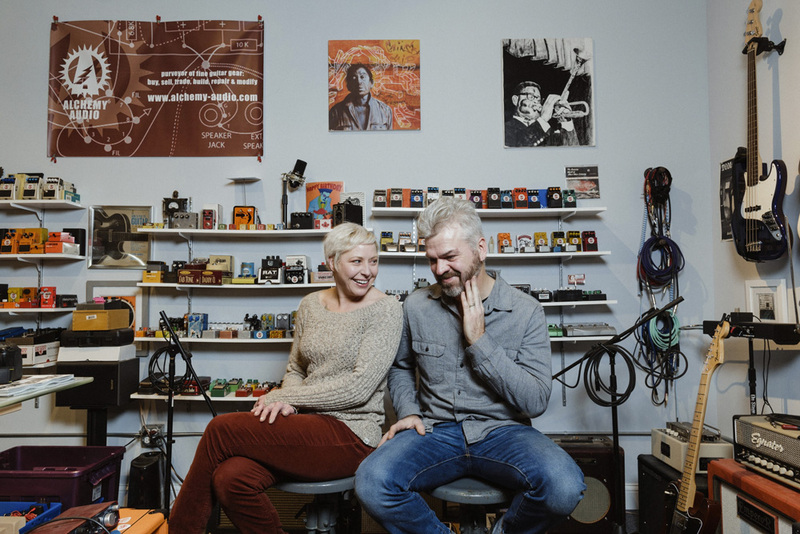 Longtime friends of Reverb, husband and wife team Johnny Balmer and Victoria Thiede run a multi-faceted operation at Alchemy Audio. 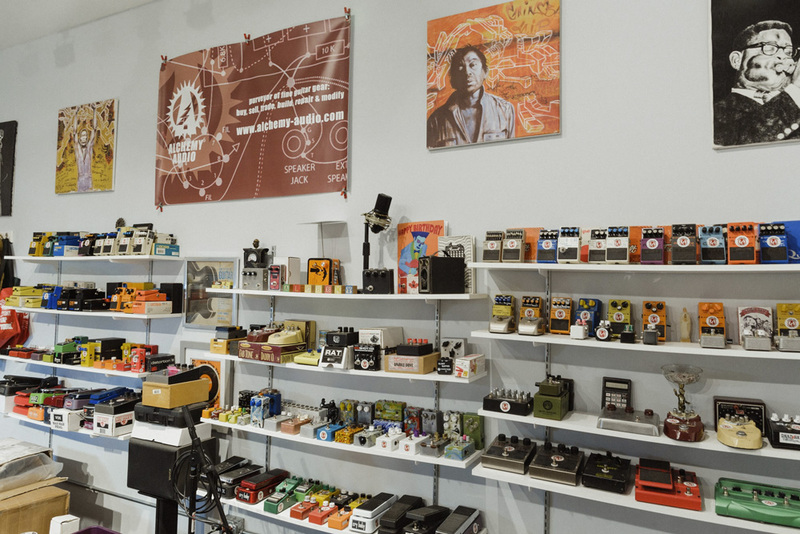 The pair builds, repairs, and modifies effects pedals, and, for interested students, they hold classes on pedal-building and modifying in their showroom and workshop. 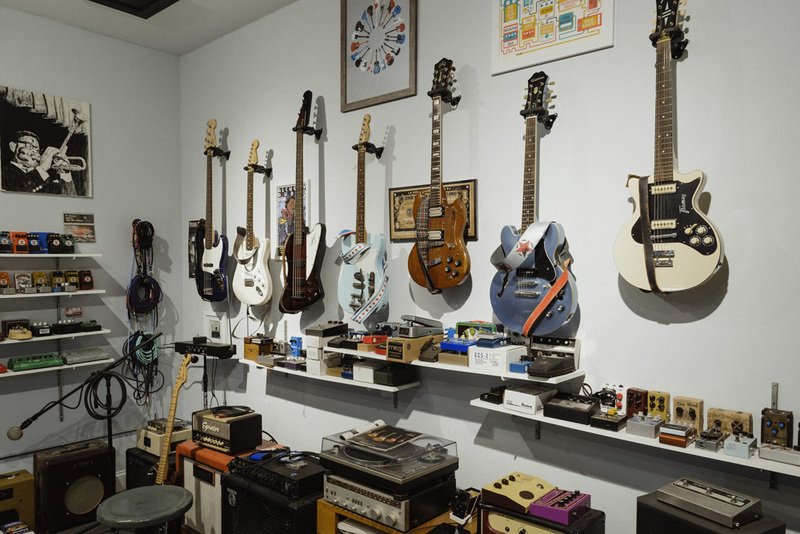 Additionally, Alchemy buys, sells, and trades instruments and gear, which has led them to work with a roster of impressive musicians and bands, like Wilco, Megadeth, John Mayer, Lucinda Williams, and Bruno Mars. Scroll through the images below for an intimate look inside Alchemy Audio, as Johnny takes you through their setup, and be sure to drop us a line at showusyourspace@reverb.com if you're itching to show off an awesome music space of your own. 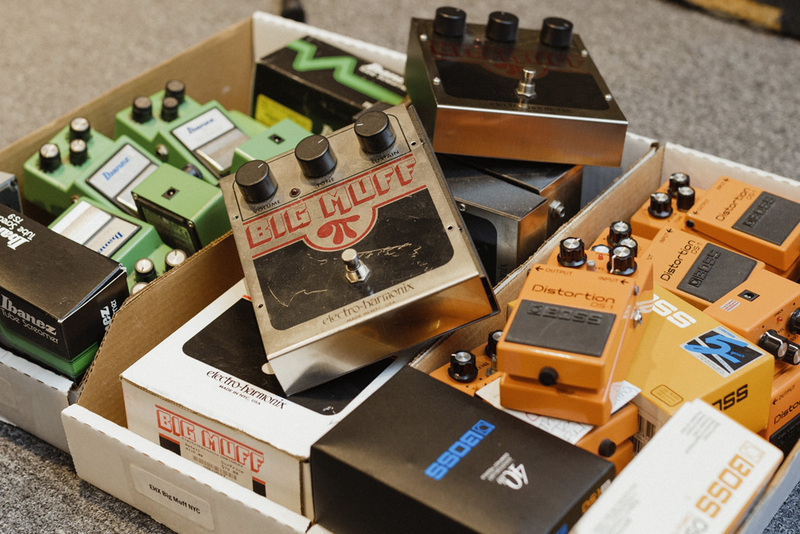 We keep a supply of common, gently used pedals on hand to modify and re-sell. They also come in handy when we need parts. This is where the magic happens. My wife, Victoria, and I have managed to fit a lot into a small space. These workstations are where we build, repair and modify gear. We also have additional room for teaching pedal building classes, which we offer every few months. In addition to a workshop, our space also functions as a showroom where musicians can visit (by appointment) and demo some of our gear. We keep a supply on hand of our most common and popular pedals. We also have a lot of gear for sale, too, which you can browse in our Alchemy Audio Reverb shop. I love low-wattage tube amplifiers. We have a variety of them in the shop, which help us test our gear on a variety of platforms. We also have several 1x12 speaker cabinets, loaded with different "flavors" of speakers. 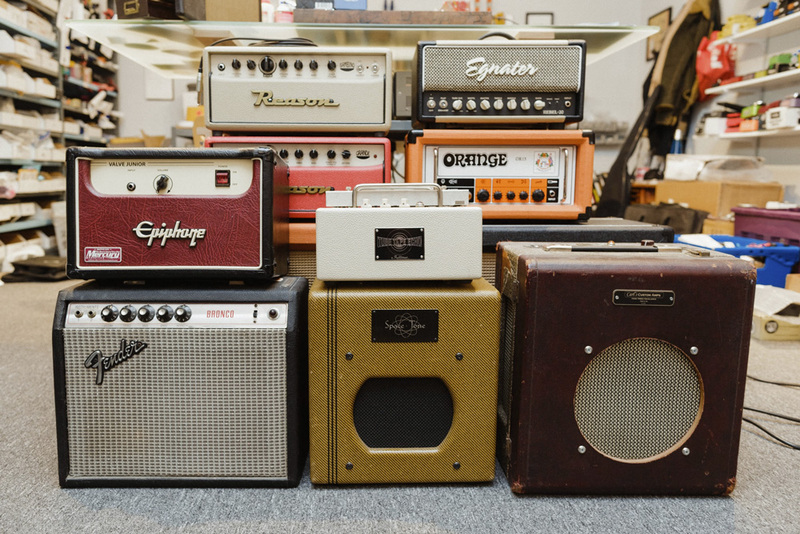 Just as with amplifiers, we keep a variety of styles and configurations of guitars on hand for testing pedals. At least half of our guitar collection was found on Reverb. Prior to launching Alchemy Audio, we managed and owned retail record stores for nearly two decades. 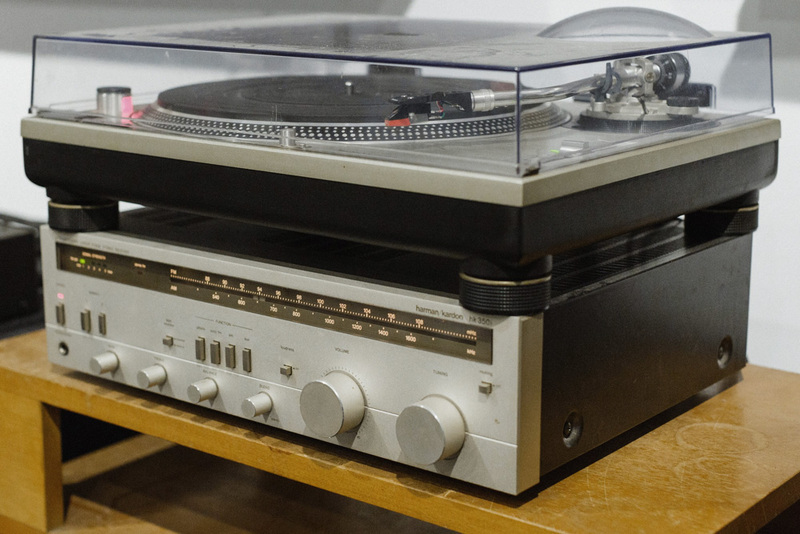 Vinyl is a huge part of our life. We listen to records while working in the shop all the time. The recent launch of Reverb LP has us very excited.